Take a walk down Park Avenue South, then up Lexington Avenue between 18th and 28th streets — a small crossroads of the NoMad, Flatiron and Gramercy neighborhoods — and it’s immediately evident that this commercial pocket is now taking on a new residential identity. Two fresh apartment buildings — the ground-up 350-unit 400 Park Ave. South and the 58-unit Huys at 404 Park Ave. South — stand on either side of East 28th Street. Nearby, the block-long, two-building conversion at 88 and 90 Lexington Ave. came to market in June and anticipates closings by year’s end. Just one block wide and 10 blocks long, this zone is quickly evolving into a neighborhood of its own, with a number of other residential projects now selling or in the pipeline. Industry sources attribute its growth to two main factors. First, builders discovered this untapped stretch as a convenient location between Midtown and Lower Manhattan, making it an attractive spot for buyers who work in either district. Second, they’re tracking a series of upscale commercial openings in the immediate area — restaurants and bars among them — and placing bets that residents also want to be in an all-in-one location where trendy amenities are within easy reach. As further testament to the shiny digs now on offer in the area, median sale prices here soared nearly 74 percent to $1.19 million year-over-year in 2014, according to StreetEasy. The same walk down these avenues just five years ago would have provided much different sights. It was a similar motivation for Equity Residential and Toll Brothers City Living, which co-developed the hybrid, Christian de Portzamparc-designed rental/condo at 400 Park Ave. South. Equity developed the 269 rental units here; Toll handled the 81 condos. The building is slated for completion this autumn. The area’s commercial offerings have only become more robust in the years since. Notable newcomers include the New American-meets-Mediterranean Irvington restaurant — helmed by executive chef David Nichols — which opened in March at the W Union Square Hotel on Park Avenue South. Last October, chef Justin Smillie and restaurateur Stephen Starr opened the California-inspired Upland eatery at 345 Park Ave. South. Nearby, May 12 marked the highly anticipated opening of hotelier Ian Schrager’s New York EDITION hotel — a luxe spot with its own restaurant and bars. Other projects in the works along this corridor include 287 Park Ave. South — a residential conversion that industry spies tell The Post will be designed by Rogers Partners and marketed by Compass. There’s also 78 Irving Place (Irving turns into Lexington north of Gramercy Park) — a not-yet-launched seven-unit conversion with sales and marketing handled by Douglas Elliman Development Marketing. 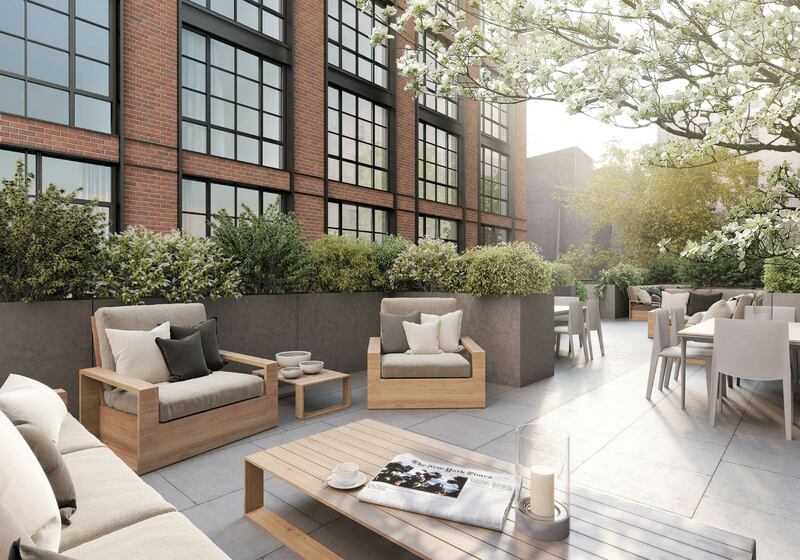 This latter project is located just one block from the Robert A.M. Stern-designed 18 Gramercy Park South conversion — a recent addition to the area, which has commanded record Downtown sales. Now, a 6,329-square-foot penthouse asks a cool $49.75 million here. The most recent newcomer is HFZ Capital Group’s 118-unit 88 & 90 Lex conversion, where prices span just over $1 million to $10 million. The two buildings — one pre-war and the other post-war — were designed by Workshop/APD, an architectural firm led by Matt Berman and Andrew Kotchen, and units boast open layouts, over 10-foot ceilings, as well as travertine and limestone touches in the bathrooms. Indeed, the heat has already spread in this direction. Prices at Chetrit Group and Clipper Equity’s conversion at 215 E. 19th St. were revealed early this month; the most expensive unit will ask $33 million. There’s also Naftali Group’s ground-up 234 E. 23rd St., which launched sales last June and will deliver its 57 units in the first quarter of 2016. There’s just one unit left here: a four-bedroom penthouse asking $6.44 million.